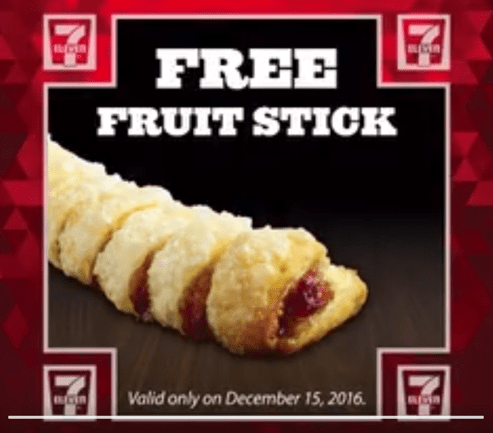 7-Eleven Canada Promotions: FREE Strawberry Fruit Stick! 7-Eleven Canada has a 5 days of FREE app-y holidays promotion on now with a FREE treat! Today, get a FREE Strawberry Fruit Stick with the purchase of any hot beverage! This promotion is valid at any 7-Eleven Canada store today only, Thursday, December 15, 2016! Available with the 7Rewards app, download & scan! Click here for more information on this 7-Eleven promotion!